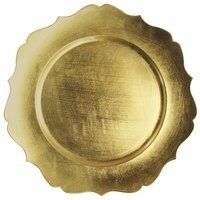 Home > Products > ChargeIt by Jay Scalloped Edge Gold Round Melamine Charger Plate 13"
The warmth and beauty of gold make the ChargeIt by Jay Scalloped Edge Gold Round Melamine Charger Plate 13" stand out on the table. Boasting an attractive scalloped edge, this charger beautifully frames individual dinner plates while its lavish gold finish provides a striking backdrop for ceramics and other dinnerware. Thanks to its lightweight, shatterproof melamine construction, this charger plate captures the look of delicate china while being exceptionally tough and durable. This premium quality piece accommodates any size plate and protects against spills and mess, perfect for presenting multi-course meals. To retain its luster, this charger plate must be hand washed only.